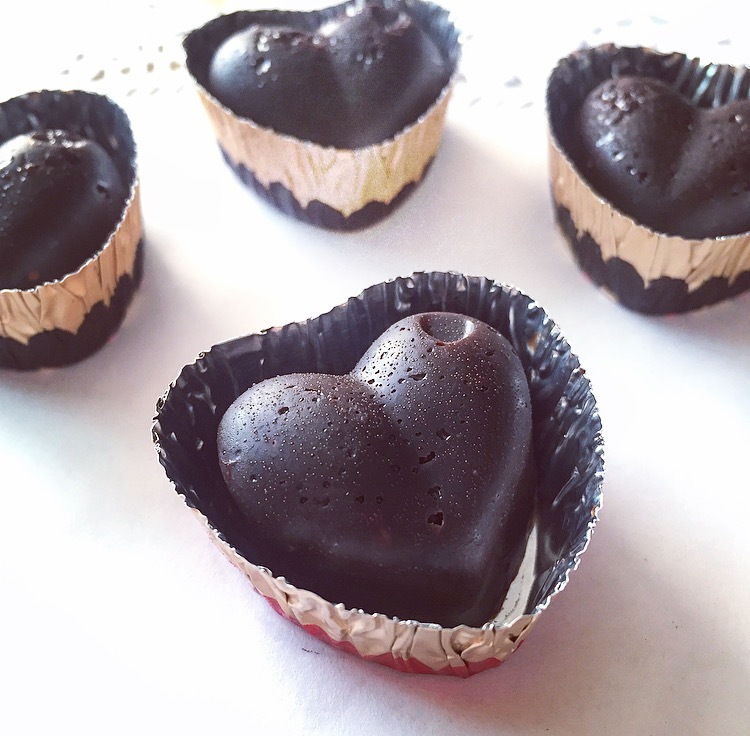 The Italian’s have a beautiful phrase, which they only use in reference to food – ‘fatto con amore’ literally ‘made with love.’ And what better gift for your loved one this Valentine’s Day than some lovingly made raw chocolates? Raw cacao is swelling with incredible nutrients, massively beneficial to our brains and frames. It contains a host of vitamins and minerals including magnesium, calcium, vitamins E and B, essential healthy fats, as well as protein and fiber. It is also an amazing antioxidant – one of the most concentrated sources of antioxidant flavanols. Cacao also contains a stimulant called theobromine, which – unlike caffeine – does not have an affect on our nervous system but creates a slow release of energy throughout the day, and also supports heart health. Cacao is also full of a neurotransmitter called anandamide, which acts as a stimulant and blocks feelings of depression. It even contains phenylethylamine (PEA), the chemical in the brain that is triggered when we experience pleasure – and the reason why cacao is so often referred to as a natural aphrodisiac. Mix all the ingredients together in a bowl. Add the flavouring you prefer – pure vanilla essence, almond essence, rose water, orange blossom water etc. Add in any additional ingredients – cacao nibs, chopped nuts, goji berries etc. make sure that the mixture is quite runny – if you add desiccated coconut (for example) this can soak up a lot of the liquid and so it’s necessary to add more coconut oil and/or sweetener to loosen the mixture up so you are able to pour it easily into the mold. Once filled, place the mold in the fridge for the chocolates to set. This should only take around 30 minutes. Remove from the fridge when hardened, and pop out the chocolates and place them in a box – the perfect healthy gift. Remember that as these chocolates are so pure, they will melt quite quickly, so keep them in the fridge until you are ready to eat them. NB. To make the Nut Butter Cups: Make the basic raw chocolate recipe, then spoon a little into the molds filling them 1/3 full. Then place in the freezer to set. After 30 minutes, remove from the freezer, spoon in a little nut butter so now the molds are 2/3 full. Place back in the fridge for 10 minutes to harden enough to then add the final layer of chocolate.